ferometer and noting the clearness of the fringes as the difference of the path varies. We then construct a curve which shall represent this variation of visibility on a more or less arbitrary scale, and compare it with one of the known forms, such as those shown in Fig. 58. There is, however, a more direct process. The explanation of this process involves so much mathematics that I shall not undertake it here. It will be sufficient to state that the harmonic analyzer cannot only be used as has been described, but is also capable of analyzing such visibility curves. Thus, if we introduce into the instrument the curve corresponding to the visibility curve, by making the distances of the connecting rods from the axis proportional to the ordinates of the visibility curve, and then turn the machine, it produces directly a very close approximation to the character of the source. For example, take curve 2 of Fig. 58. By its derivation we know that it corresponds to a double source each of whose components is absolutely homogeneous. If we introduce this curve, or rather the envelope of it, into the machine, it will give a resultant which represents the character of the source to a close degree of approximation. The actual result is shown in Fig. 59, in which the ordinates represent the intensity of the light. 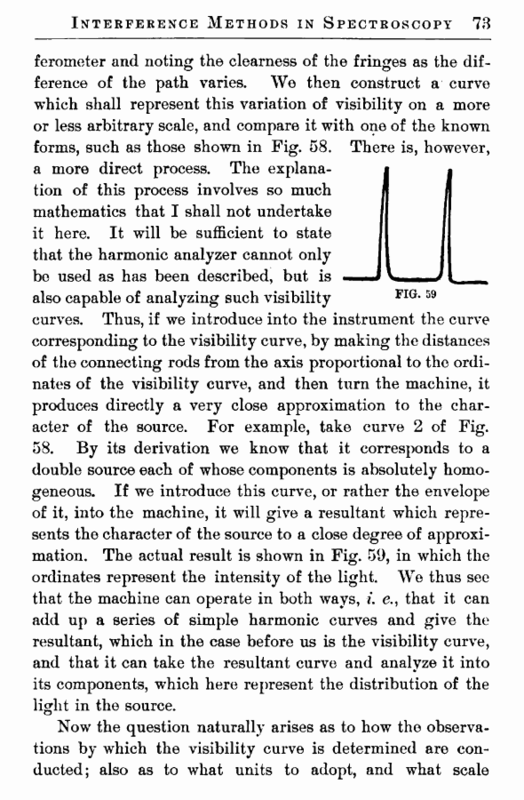 We thus see that the machine can operate in both ways, L <?., that it can add up a series of simple harmonic curves and give the resultant, which in the case before us is the visibility curve, and that it can take the resultant curve and analyze it into its components, which here represent the distribution of the light in the source. of measurement. It is apparently something very indefinite. The visibility is not a quantity that can be measured, as we can a distance or an angle—unless, to be sure, we first define it. After defining it properly, we can produce, in accordance with that definition, interference fringes that shall have any desired visibility. By the use of fringes which have a known visibility we can educate the eye in estimating visibility, or we may have these standard fringes before us for comparison at the time of observation, and may then determine when the two systems are of the same clearness; and when they are of the same clearness, we say that the desired visibility is the same as that whose value is known from our formula. 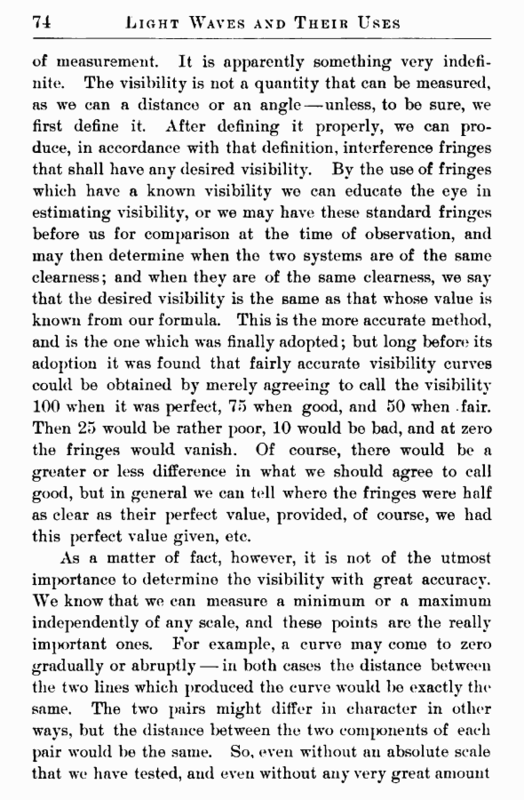 This is the more accurate method, and is the one which was finally adopted; but long before its adoption it was found that fairly accurate visibility curves could be obtained by merely agreeing to call the visibility 100 when it was perfect, 75 when good, and 50 when fair. Then 25 would be rather poor, 10 would be bad, and at zero the fringes would vanish. Of course, there would be a greater or less difference in what we should agree to call good, but in general we can tell where the fringes were half as clear as their perfect value, provided, of course, we had this perfect value given, etc.